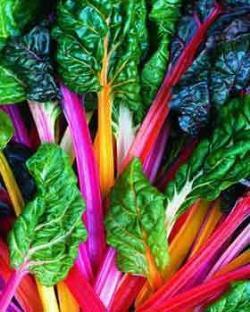 Check out this edible landscape known as Swiss Chard, considered to be one of the healthiest vegetables available. The leaves are always a nice bronze to dark green color, while the stalks vary in colors such as yellow, gold, orange, pink, violet, green, white, red and striped. Making Swiss Chard a great addition to any landscape or dinner plate. If eaten, leaves are best harvested young and can be eaten like spinach or used in salads.